There are few bassists who can sing and there are even fewer who can do it well. Kristin Korb is one of those artists who make you forget that she is playing the bass when you hear her crystalline voice. The SDSU Jazz Ensemble, under the direction of Bill Yeager, will play with Kristin Korb, bassist and vocalist, on Thursday, April 5, 5pm and 7pm (two performances) in Smith Recital Hall. Tickets $10 - $20 at music.sdsu.edu. Professor Bill Yeager has a long-standing tradition of inviting special guest artists to play with the SDSU Jazz Ensemble. All guest artists are professional jazz musicians who are actively working and performing in the field, which provides the students with an invaluable performance opportunity, and audiences with a very special concert. She has taught at the University of Southern California where she was coordinator of vocal jazz studies, Azuza Pacific University, Grossmont Community College, and was Director of Jazz Studies at Central Washington University. Korb is still very involved in educational outreach and teaches at universities, jazz camps, and festivals with young students. 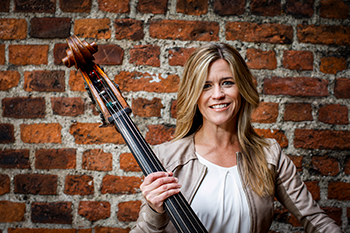 Kristin tours across the world and has performed with jazz artists such as Llew Matthews, Kim Richmond, Pete Christlieb, Jeff Hamilton, Alex Riel and Jan Lundgren. She now lives in Denmark with her Danish husband. The SDSU Jazz Studies Program has long been one of the premier jazz studies programs in the United States and regularly attracts the finest talent from the U.S. and abroad. The program offers both undergraduate and graduate degrees in jazz studies and is committed to turning out students who are competent, passionate, highly motivated and willing to take risks. From education to research, from performance to composition, students can create strong individual profiles to enhance their musical development. Through immersion in an environment of rigorous teaching, open inquiry, and deep exploration, students are encouraged to create works, performances, and ideas that have yet to be imagined. For more information visit musicdance.sdsu.edu.